It’s every parent’s nightmare. Your child is approaching the driving age, and all they seem to talk about is getting their own car and being able to drive. As if you weren’t worried enough about him or her being on the road, the thought of the added car insurance costs is enough to send shivers down your spine! Insuring a teen driver can be insanely expensive. Even for the most basic policy, you’re still looking at a significant boost in the cost of your premium. So what can you do to make sure your teenage driver is covered by auto insurance without having to go out and get a second and third job to cover the costs? Fortunately, there are a few things that you can do to help reduce your costs. That means you can put down those second and third job applications, and read on to learn how you can cut the cost of car insurance for teenagers. You should be comparing car insurance rates every year, whether you have a teenage driver or not. It’s no secret that auto insurance companies raise their rates on current customers while offering bottom level prices to new ones. You’d be surprised how much you can save simply by switching to a new car insurance provider every year. With respect to insuring your teenage driver, doing another rate comparison is definitely worth your time. By comparing rates, you’ll be able to see if it’s cheaper to add your teenager to your existing car insurance policy, or to have them get their own separate policy. Do not just call your current car insurance provider to compare joint and separate policies. You would actually benefit most by looking at other companies first, and then using their rates as leverage with your current provider to get the best rate possible. Note: In some instances adding a teen to your policy can double it. There’s no doubt that you’ll be paying more per month than you are currently, but by performing a car insurance rate comparison, you’ll be able to find out how to best keep those added costs down. Of course, if you ask your son or daughter if they need their license, they are going to say yes. Being able to drive is a status symbol, and they’ve probably spent every waking hour for the last year dreaming about being able to drive. However, if you’re fine with driving them wherever they need to go, be it school, the mall, or a friend’s house, then they may not really need a license just yet – A learner’s permit would be just fine. Some states do not require those with learner’s permits to be insured, so contact your insurance provider to see if that is the case in your state. Note: Check top insurance firms first, if the cost is too high you can check with less popular companies. So how can you break the news to your teenager that they won’t be getting their license for a few more years? Honesty is the best practice. In fact, they may not even care one way or the other. If they do give you a hard time, educate them a bit on the dangers of driving, and make them look into the costs of teenage car insurance rates. When they see how much they’ll have to pay each month, they may decide that waiting to drive on their own isn’t so bad after all. So you lost the battle of having your son or daughter wait a few more years to get their license. Don’t fret, as you still have options to keep your car insurance costs down. One of the easiest ways to reduce the costs associated with auto insurance for teenagers is to have them drive a cheaper car. Sure, they’ve probably went on and on about how they wanted that fast sports car, or maybe that cute new Civic. However, they don’t really need those cars – all they need is a reliable, safe, and boring vehicle that works. While a sports car is more exciting and fun to drive, it also costs a ton to insure, particularly if it is driven by a teenage driver. A teenager driving a sports car is more likely to get speeding tickets, and to get into an accident – both of which translate into higher car insurance rates. While a cute new car may not be the speed demon that a sports car is, it still will cost more to repair and replace should an accident happen. It’s also more likely to be stolen, which makes it more expensive to insure. In all reality, your teenager still needs to learn how to drive – they may have a license, but they still lack experience. They’d be better off with a reliable, safe, and boring car to gain the experience they need. The safer, reliable vehicle may not be as exciting, but it will sure save you and your child a ton of money on your car insurance rates. But what if your teenager driver doesn’t have a car yet, and is, instead, using one of your cars to drive? How could you save money on your car insurance then? If you’re in a situation where your teenage driver doesn’t have their own car, there’s still an easy way to save. Add your teenage driver to your policy only on the cheapest car that you have. It will cost you far less to do that than to add them as a driver on all of your cars. Just be careful not to have them drive your other cars too often, just in case they do get into an accident. Believe it or not, your teenage driver could be eligible for discounts! Most car insurance policy holders that have a teenage driver fail to do the one thing that could save them a bundle every month – they never ask for a discount. Note: For teens the most important factor is to maintain a clean driving record. Statistics indicate that teenagers that perform better in school typically tend to be safer drivers. It’s for that reason that auto insurance providers offer discounts to those with higher grades. However, don’t expect your car insurance company to voluntarily offer that discount. If your child is a good student, and has the grades to show for it, give your car insurance provider a call to see if they offer that good student discount. They may require you to send in a copy of their most recent report card, so make sure you have that handy. Most good student discounts are in the range of 10%, which may not seem like a whole lot, but it can provide for a decent chunk of savings each month. If you’re teenage driver hasn’t hit the grades needed for that good student discount, there are still opportunities out there for him or her to save on their car insurance. 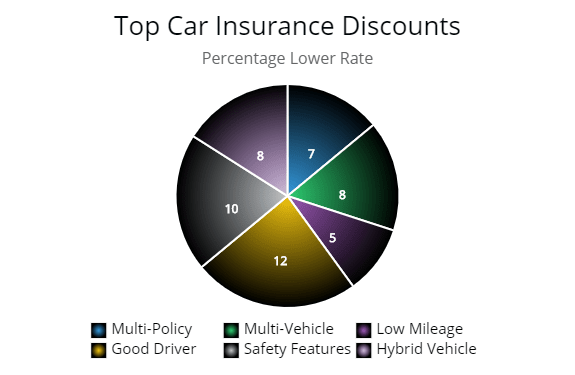 The majority of car insurance providers offer discounts to those that take certain classes, such as Defensive Driving. As soon as your son or daughter gets their learner’s permit, sign them up for a Defensive Driving class. Upon completion, they should receive some sort of certificate that you will present to your auto insurance provider. Once they have it on file, you’ll be able to enjoy some nice savings on the policy for your teenager driver. The discounts don’t stop with a Defensive Driving class. Teenage drivers can actually be eligible for safe driver discounts after they’ve had their license for a certain period of time. When you add your teenage driver to your policy, make sure you ask when they are eligible to qualify for a safe driver discount. After they’ve fulfilled the required time period, contact your insurance provider, and ask for the safe driver discount to get the savings they deserve. In order to ensure that your teenage driver gets that safe driver discount, it is essential that, as their parent or guardian, you educate them on what it means to be a safe driver. Being behind the wheel is a new experience for drivers – and it is one that provides for a ton of distractions. From the stereo to their passenger seat to mobile phones, there is plenty that could cause them to take their mind off driving and lead to an accident. Before your teenage driver hits the road, educate them on the distractions, and consider having them sign a contract promising to be a safe driver. By teaching them that responsibility, you’ll get peace of mind as a parent or guardian, and you’ll save on your car insurance!